I went to the Met last night to see Hamlet with my mother. We had a rather interesting time. Below is my letter to Anthony Tommasini at the Times about our truncated evening. I wanted to write to you in the hopes that you would share my comments with your many followers. I am a season subscriber to the Metropolitan Opera and this evening I attended Hamlet there. I was seated house right in the family circle. Around 9:15, a funny smell started emanating from above us. As the smell grew stronger, it became clear it was the smell of smoke and was coming from above and behind us. Patrons started murmuring, one woman ran up an aisle to alert an usher. Still the smell grew and at this point people started to get up. As smoke began to fill the family circle, the crowds began to push and shove to make their way to the exits. The singers seemed to sense something was wrong and appeared to lose a bit of focus. I helped an elderly man down the stairs (I’m a young man) and then brought my mother down and outside. There an excited crowd was forming – all people who had been seated in the family circle. Shockingly, it seemed no one from the MET had called the fire dept. A man next to me was on the phone saying, “…but there is a fire at the Opera House. Yes here! At the MET! No one has called?” The fire dept came a few minutes later as I and the others around me clicked pictures on our camera phones. I couldn’t believe the management had not cleared the entire house but was far more shocked at what came next. A representative from the MET tried to stop the fire fighters from entering saying it had all been a mistake and that the smell was from a burning gel on stage. Now, I’m an actor and have been on stage under a burning gel affixed to lamp more than once. The smell tonight was a lot stronger than a burning gel. Additionally, only the people in the family circle seemed to be aware of it, not anyone down below. When I pointed this out to the MET representative he yelled at me that SMOKE RISES! The cleared-out audience members chimed in to agree with me as the firefighters passed. Everyone was yelling out that the smell was isolated to the family circle. 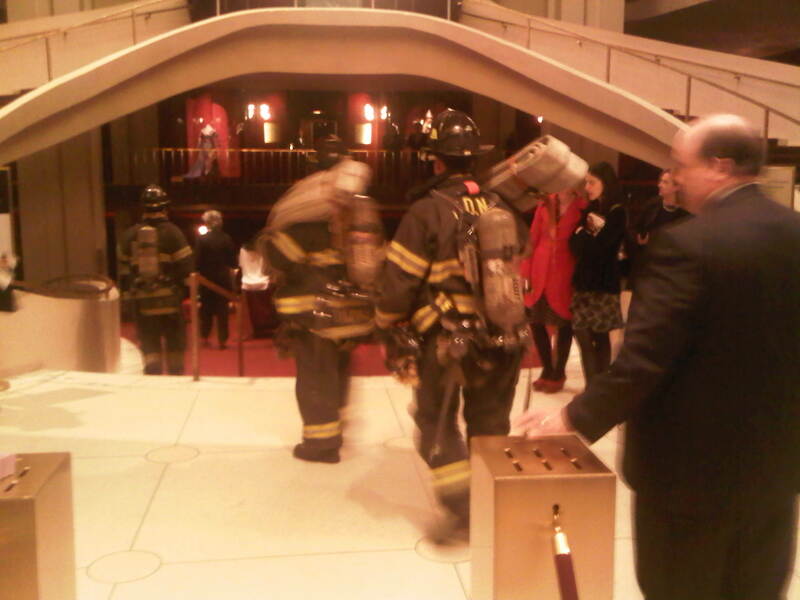 Patrons even broke into applause as the firefighters pushed into the lobby. As they did so, representatives from the MET raced forward to lead them down and away from the family circle. This is shocking and appalling. I doubt the smoke signaled any real danger. It was probably a small electrical fire or perhaps a smoldering lamp up in the family circle. But to deliberately mislead fire department officials, to lie and tell them that the source of the smoke was a gel on stage and that the gel had been located, is a dangerous and despicable precedent. The MET seats approximately 3,800 people. A stampede in an emergency situation would be life-threatening to patrons, particularly the elderly. To fail to stop a performance for even ten minutes to properly isolate the cause of a problem and to deliberately mislead officials who risk their lives for our safety is beneath contempt. I hope you will share my concerns with your readers and with officials at the MET. I am only a subscriber up in the cheap seats, but I truly think this is an incident that should be communicated to those who are under the mistaken belief that the MET’s management prioritizes their safety over finishing ACT V by 11pm.